Ethan Hanley grew up in the U.S. Virgin Islands and has been on the water his whole life. He started sailing in his local summer camp’s youth program and immediately fell in love with the sport. Ethan started a brief but competitive Optimist career at the age of 12 and quickly grew too big for the boat, from there he began sailing with his high school 420 team and an started an independent laser career. 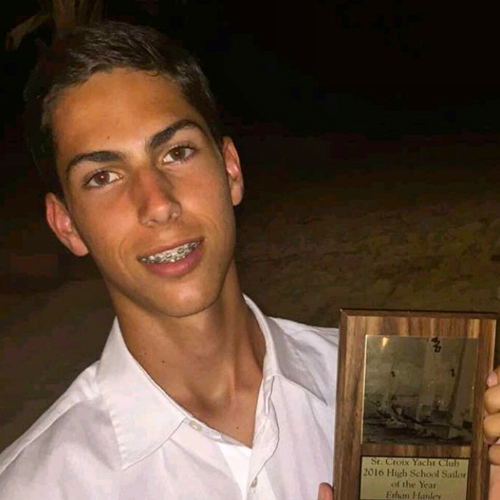 As a Freshman, Ethan was the captain, A-Skipper, and MVP of his high school team. He sailed with a youth J36 crew in regattas held in the Virgin Islands, skippered a J24, competitively sailed in the C420, and crewed bow on IC24s. Ethan discovered that his true passion is match racing in The Sonar class in Chicago. He is currently training at the Oakcliff sailing program in the Inshore Acorn program to further explore his interest in a match racing career.